Status: Threatened by large mammals, humans, disturbance of natural habitat, hedgehoges, foxes, badgers, other snakes and fish. The name comes from a patch of bristly scales above each eye that tend to look like eyelashes. They tend to reach from 22-32 inches in length. 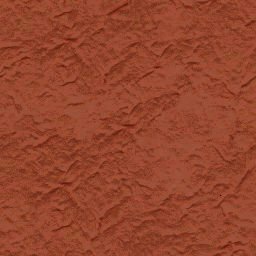 Color has a great variety that usually depends on the geographical origin of snake..
Have a pair of heat-sensitive pits between the eyes and nostrils. They tend to have very long fangs. The eyelash viper is a nocturnal, arboreal animal. This means that it does most of its hunting from late evening through early morning, and more than likely in, from, or around trees. When subduing its prey, the snake grabs it and holds on while it injects a hemotoxic venom. The snake holds on until the animal is dead and then proceeds to swallow it by "walking" it down the throat by moving one side of its jaw at a time. Eyelast vipers are usually not known to be an aggressive snake, however it strikes instantly if anyone brushes against it. Vipers are also one of the most dangerous of the poisonous snakes on Central America. Their venom affects the central nervous system of their victim as well as the cardiovascular system. With small animals the venom can kill within minutes, but larger animals rarely succumb unless the viper manages to inject a large amount of venom into the victim. Because the viper is arboreal, most bites to humans are to hands, fingers and occasionally to the face. They usually result in lots of pain, swelling, bleb formation, bruising and sometimes necrosis, that may lead to contraction or even amputation. The most common effects that happen from the venom are vomiting, diarrhea, prostration, or sometimes loss of conciousness. There are sometimes very severe cases that lead to death, mainly to crop farmers and plantation workers. Oh, a word of warning, sometimes vipers get accidently shipped overseas in banana shipments, so be careful if you have to open any up. Vipers use their sense of smell to find mates. The males go through an amazing thing called "the dance of the adders" when they are competing for the same female. They face each other with the head and the forepart of the body held erect, while trying to puch the other to the ground. This sometimes can go on for hours. The ironic thing is that during this competing there is no biting from either contestant. Vipers bear litters of 6 to 20 live young that range in length from 5 to 8 inches. The young look exactly like the adult except they are smaller. That the eyelash vipers are named for the pointed scales above their eyes. 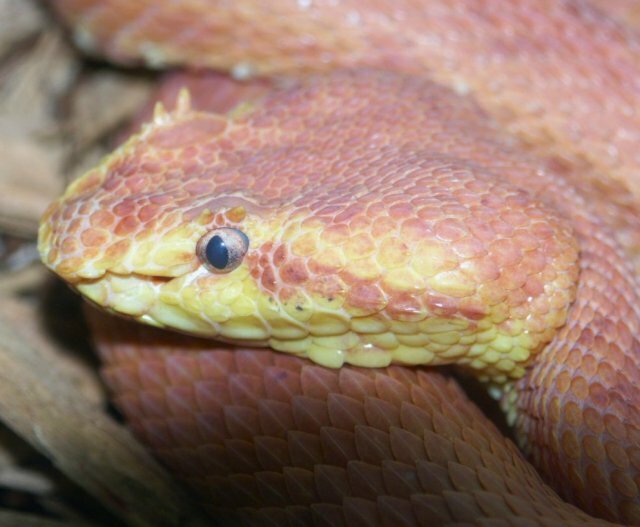 The eyelash vipers can be recognized by its color and triangular shaped head. Their scales are rough and sharp suspected to protect them against the branches and vines of their arboreal habitat, unlike most snakes whose scales are smooth. It has a prehensile tail. They can exhibit about five different color phases. 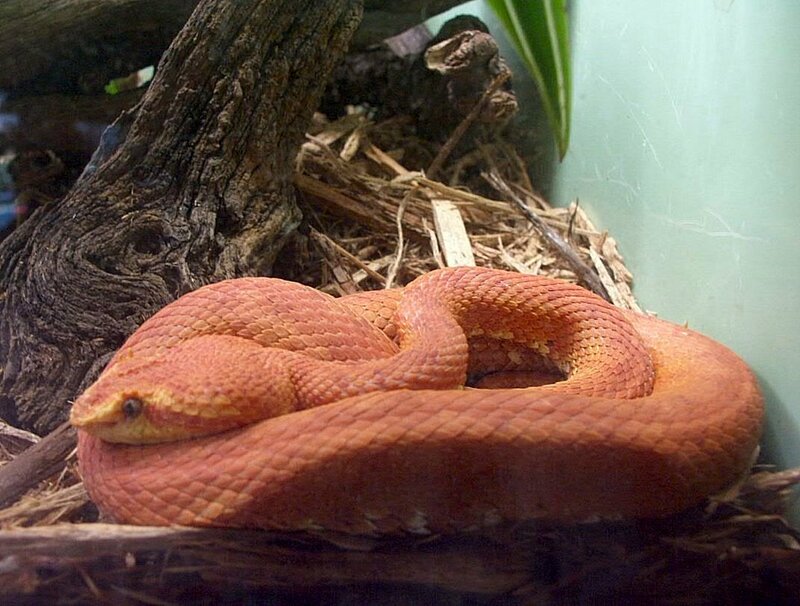 The eyelash viper is one of the smallest poisonous snakes in Central America, but one of the most dangerous. They usually don't bite humans unless they feel threatened, by teasing or trampling. There is a joke in Costa Rica about vipers: they say, "if you're looking down, your're going to be bitten by the Eyelash Viper. If you are always looking up, it will be (Velvet Death)." They have been inadvertantly been sent throughout the world in banana shipments. The viper has an unsual but quite normal special adaptation. It has the ability to catch and eat its food while suspending it-self in midair off of a branch. The coloration of the snakes in certain parts of the world also is a great adaptation. I say this because a number of color variants exist that help the snake to "comouflage" itself, in order to strike at prey easier from hiding. The "eyelashes" on the vipers can also help camouflage the snake. They make it harder for prey and enemies to distinguish the snakes from surrounding foliage..
Grolier Incorporated, Danbury, CT. Vol. 28, 1981. Encyclopedia Americana International Edition.